If you’ve ever been in the hospital for one of those annoying spider-bite like boils on your body, then you probably recognize the acronym MRSA and cringe. Methicillin-resistant Staphylococcus aureus (MRSA) is a bacteria that has been causing deadly infections in humans due to its resistance to most antibiotics. The bacteria most commonly lingers around hospitals, but can be found in gyms and schools as well. 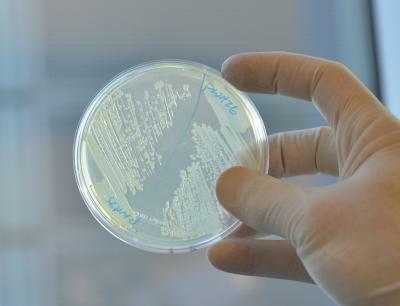 With few medicines available to treat the infections caused by MRSA, scientists from Harvard’s Wyss Institute for Biologically Inspired Engineering and Boston University have been studying the biological makeup of this sneaky bacteria villian to find better ways to fight it. The researchers, using computer modeling and biotechnology of a similar bactera E. coli, found that simply adjusting the bacteria’s metabolism may be a way to kill it. Collins and his team found that the bacteria produce “reactive oxygen species” as part of their regular metabolic activity. Reactive oxygen species (ROS) include molecules such as superperoxide and hydrogen peroxide. While normal production of ROS doesn’t harm the bacteria, too much can kill it. Therefore, the secret antibiotic may be one that can somehow increase metabolism and therefore production of ROS. “The next challenge was to determine if increasing the ROS production by the cell itself would render it more susceptible to death by oxidative, ergo, antibiotic attack,” Collins said. Collins and his team hypothesized corrrectly. By adjusting the bacteria’s metabolism, the antibiotics successfully killed the bacteria. Although this is a great discovery in the many mysteries of public health today, Collins and his team still need to find out exactly which molecules are responsible for increasing ROS production and then test it on other types of bacteria. Although there is still a long way to go, this study can be seen as a battle won in the war against antibiotic-resistant bacteria. This work was funded by the Wyss Institute for Biologically Inspired Engineering at Harvard University, the National Institutes of Health Director’s Pioneer Award Program and the Howard Hughes Medical Institute. In addition to Collins, the research team included: Mark P. Brynildsen, Ph.D., formerly at Boston University and now Assistant Professor in the Department of Chemical and Biological Engineering at Princeton University; Jonathan A. Winkler, Ph.D., a Scientist at Seres Health who used to be a Postdoctoral Scholar at Boston University; Catherine S. Spina, an M.D./Ph.D. candidate at Boston University and Postdoctoral Scholar at the Wyss Institute; and Boston University Research Assistant I. Cody Macdonald.